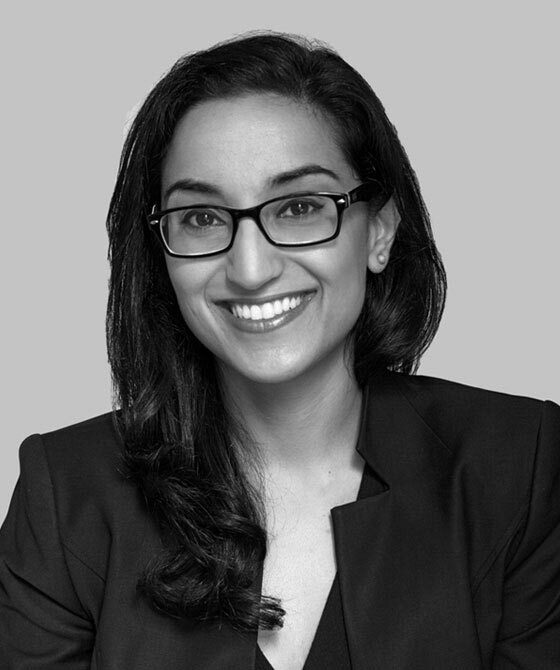 Sunyana Sharma is a busy regulatory and criminal law specialist with significant expertise in the health and safety, maritime, fisheries and professional disciplinary sectors. She has been appointed to the C list of Regulatory Advocates for the Health and Safety Executive, Office of Rail Regulation and the Environment Agency. She has both defended and prosecuted in various regulatory law matters, which have included collisions at sea, fisheries offences, breaches of a health and safety regulations, animal welfare and trading standards prosecutions. Furthermore, she regularly appears before various disciplinary tribunals. Sunyana is regularly invited to speak on regulatory matters to solicitors and industry experts. Represented an employee as an interested party at a three day jury inquest into the death of a colleague whilst at work following a fall through a Perspex roof on his employer’s premises. Represented a Company and its Director for producing and supplying an ‘unsafe product’ known as the ‘Nutkins cot bed’, attempting to pervert the course of justice and breaches of the Consumer Protection from Unfair Trading Regulations 2008. This was a high profile case which featured on the BBC’s ‘The One Show’ due to the near death of a child. Drafted in at the last hour to represent a Company in a complex application to dismiss for offences pursuant to regulation 4 of the General Food Regulations 2004 as enabled by the Food Safety Act 1990 relating to the traceability requirement and an offence contrary to the regulation 19(1) and 19(2) of the Food Safety and Hygiene (England) Regulations 2013 in respect of the processing of raw cow’s milk. Represented the Crown in prosecuting a slaughter house for failing to take a stem cell sample from a bovine contrary to regulation 5(a) and paragraph 8(1) of Schedule 2, Transmissible Spongiform Encephalopathies (England) Regulations 2010. Instructed in advising a Company and its management on a local authority prosecution in relation to hygiene offences and emergency prohibition order breaches under the Food Safety Act 1990 of its restaurant. Represented South Weald Inns Ltd in an appeal of a noise abatement notice pursuant to the Environmental Protection Act 1990. Represented the Defendant Company for breaches of the Health and Safety at Work Act 1974 and Work at Height Regulations 2005 arising from the fall of an employee whilst working at height. Successfully prosecuted 3 Defendants in a 9 day appeal to the Crown Court for a local authority for breaches of s.234 and s.72 of the Housing Act 2004. Successfully prosecuted a 78 year old Defendant for 11 out of 18 offences for breach of a noise abatement notice under the Environmental Protection Act 1990. Instructed to advise a Company on various toys that breached the Toy Safety Regulations 2011, The General Product Safety Regulations 2005 and the Trade Marks Act 1994. Represented a Defendant for breaching her licensing conditions with the Local Council for contrary to s.95(2) of the Housing Act 2004 for permitting more than one household to live in her tenanted property. Strong discussions led to the prosecution being abandoned and the Prosecution agreeing to the Defendant being cautioned. Defended a farmer for his lack of duty of care and for causing unnecessary suffering to a number of pigs pursuant to ss. 4 and 9 of the Animal Welfare Act 2006. Following the discovery of a number of dead pigs on his farm. Successfully avoided a Disqualification Order being imposed. Represented OTSS for a joint prosecution of a Company and Director for supplying unsafe goods under The Electrical Equipment (Safety) Regulations and Consumer Protection Act 1987 and breaches of s.92 of the Trademarks Act 1994. Defended a barefoot trimmer for his actions relating to a horse s.4 and s.9 offences under the Animal Welfare Act 2006. Despite the Defendant being convicted, a Disqualification Order was avoided. Successfully prosecuted a four handed ‘dodgy trader’ case under the Fraud Act 2006 and the Consumer Protection from Unfair Trading Regulations 2008 for mis-selling solar panel systems to pensioners. Her clients include: masters, owners, charterers, operators, harbour authorities and the MCA. Represented the owners of a Fishing Company on a high profile three handed fisheries matter in the Falkland Islands for breaches of ss. 167 and 168 of the Fisheries (Conservation and Management) Ordinance 2005 and Regulation 61 of the Fishing Regulations Order 1987 for failing to report £184,038 of hake. Avoided a conviction of the s.168 offence which would have lead to the forfeiture of the owner’s vessel, which has been valued at £1.5million. Successfully prosecuted a fisherman on behalf of the MCA for harvesting shellfish from a prohibited area of Southampton Waters contrary to Regulation 19(1) of the Food Safety and Hygiene (England) Regulations 2013, failing to display navigation lights at night pursuant to the rule 23 of the COLREGs, displaying the Port of Registry and Fishing Numbers on his vessel despite his vessel being unregistered for a period of 2 years, contrary to s.15(3) and (5) of The Merchant Shipping Act 1995. Represented a multi national Company for breaching s.65 of the Marine and Coastal Access Act 2009 in that it deposited dredging material in an area outside the area designated within the licence at HMNB Devonport on 31 occasions. Instructed to advise the Master of a dredger for offences under the Merchant Shipping Act 1995 following a collision that led to a fatality. Successfully prosecuted a hovercraft driver who was almost 3 x over the legal limit in alcohol whilst under passage between Southsea, Hampshire & Ryde, Isle of Wight under the Railways and Transport Safety Act 2003. Successfully defended the driver of a rib for breaches of The Merchant Shipping (Distress Signals and Prevention of Collisions) Regulations 1996, following a collision on the Cardiff Bay. Prosecuted on behalf of the MCA a charity company which had failed to operate a passenger vessel with a valid passenger certificate as required under The Merchant Shipping (Survey and Certification) Regulations 1995. Represented a Fishing Company for dredging £12,500 worth of undersized scallops, a regulatory offence pursuant to The Scallop Fishing (England) Order 2012 and The Sea Fish (Conservation) Act 1967. Represented Owners of a Spanish Vessel for breaches under the Merchant Shipping Act 1995 and Health and Safety at Work Regulations 1997 for Merchant Shipping and Fishing Vessels. Represented the Master of a vessel who was involved in a collision with another vessel on the Thames Barrier for offences contrary to The Merchant Shipping (Distress Signals and Prevention of Collisions) Regulations 1996. Sunyana Sharma has developed a strong practice in professional disciplinary regulation following a 6 month secondment as a case presenter at the Nursing and Midwifery Council (‘NMC’). She appears regularly in the various healthcare tribunals which include the NMC, General Chiropractic Council (‘GCC’), Health and Care Professions Council (‘HCPC’), General Medical Council (‘GMC’), General Optical Council (‘GOC’) and General Dental Council ‘GDC’ for substantive misconduct and health hearings, interim order applications and substantive order reviews. In addition, she is regularly instructed by nursing, care homes and GP Surgery’s appealing CQC decisions before the First Tier Tribunal (Health, Education and Social Care Chamber). Having developed an in depth and robust understanding of the ‘fitness to practise’ regime, she takes instruction in all professional disciplinary cases including doctors, osteopaths and other healthcare workers. Currently instructed to represent a Doctor for carrying out medical practise whilst not holding a licence to practise. Represented a social worker for receiving a caution for disclosing sexual photographs of his ex partner. Represented an optician for over 50 misconduct allegations relating to the adequate sight testing, the fitting of contact lenses, record keeping and dishonesty. Instructed to advise a registrant on an appeal to the High Court relating to a Substantive Order determination on dishonesty. Represented the NMC at a misconduct substantive hearing in which the registrant was undertaking shift work when signed off sick and working excessive hours, including a continuous 37 hour shift. Instructed to represent a dental technician for acting outside his scope of practice. Successfully represented the NMC for a 9 day substantive misconduct hearing against two nurses for restraining a vulnerable dementia patient to a hospital bed with a bedsheet and cable ties. Represented the NMC for dishonesty allegations against the Registrant who had produced and provided false references to an NHS Trust to obtain a Band 5 Nursing post. The five day substantive hearing resulted in the Nurse being struck off. Represented the GCC for a substantive order review hearing of a Chiropractor who had been convicted of acts of voyeurism. Successfully represented EJ in a four day substantive hearing for allegations of unacceptable professional conduct relating to a sexual relationship with a patient, confidentiality breaches and dishonesty. Appeared on behalf of an optician who despite having failed to complete his pre-registration. Ad Hoc secondment with the GCC to advise on cases (2016). Six month secondment as a case presenter to the NMC dealing with a variety of misconduct and lack of competence cases (NMC, 2013). Assisted the public and regulatory team on advising the Nursing and Midwifery Council (‘NMC’) on ‘fitness to practise’ cases under the NMC ‘Code: Standards of conduct, performance and ethics for nurses and midwives’, ‘Standards for Medicines Management’ and Guidance on ‘Recordkeeping’ for nurses and midwives (Blake Morgan, 2012 and Fieldfisher Waterhouse, 2011).